From July 1 2013, the vaccine schedule for pre-schoolers will include Varicella (chickenpox) for the first time and also two new meningitis shots. Children who are not up to date with their vaccines* will not be allowed to enrol in child care centres. Recently we ran an article on the debate over vaccinations and whether children should be allowed to attend child care without them. It seems that overwhelmingly people are in favour of compulsory vaccination with 89% who took part in a poll by SBS saying they should be compulsory. The Age reported that the National Health Performance Authority had found 70,000 children were not fully immunised in Australia, and following Bills introduced into state parliaments, it is now the law in most states, or will shortly be becoming so, for all children to be up to date with their vaccines before enroling in formal child care. Children who haven’t had their shots won’t be able to attend child care, and centres will be fined if they don’t hold proof of a child’s vaccination status under a crackdown by the NSW government. Not only will the lack of proof of immunisation prevent children enrolling in child care and school, but the vaccines are now required in order to receive Family Tax Benefit Part A supplement and government childcare payments. So there’s a definite financial incentive to make sure you don’t forget. While some parents reject the scientific evidence and elect not to immunise their children, the vast majority are simply forgetting so the onus is on both parents and child care operators to make sure that these children get their shots before attending child care, and then of course, before they start school. Operators could face fines of $4,000 if inspectors discover children in their care who don’t have proof of vaccination. Although a ridiculous loophole allows parents to object to vaccinations on philosophical, religious or medical grounds. These parents however will need to provide a certificate from their GP or an immunisation nurse after undergoing compulsory counselling. 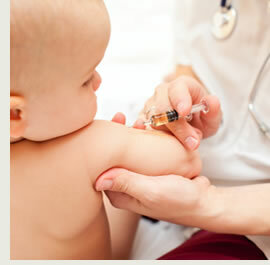 As of July 1, the fully immunised criteria for babies turning one in 2013 will include meningococcal “C” and pneumococcal. Varicella for chickenpox will also be included at 18 months. The meningococcal vaccine for strain “C”, which has been available for 10 years, has resulted in a dramatic drop in the number of cases of this disease, which also causes blood poisoning, marked by an aggressive purple rash. This rash (which doesn’t disappear when pressed under glass) is unfortunately one of the latter symptoms and very often, once it is noticed, it’s already too late to save the child. It’s not common, but it’s still a threat, particularly to young children aged between 2 and 10, so it’s incredibly important to prevent this disease. Professor Robert Booy, head of clinical research at the National Centre for Immunisation Research and Surveillance (NCIRS) said that the vaccine has saved many lives. “In the 10 years since we started meningococcal “C” vaccinations we’ve seen a 95 per cent drop in disease. In 2011 there were only nine cases of meningococcal “C” reported compared with 162 in 2002,” Professor Booy said. The group “B” strain of the bacterial disease, for which there is no current vaccination, was responsible for 83 per cent of the 222 cases of meningococcal disease last year. A vaccine for strain “B” may be available in the next 12 months, but Leanne Weymark-Cotter from Meningococcal Australia said parents need to be aware that fully vaccinated does not mean fully covered against meningococcal “B”. Parents and carers must be vigilant and look after symptoms, which are similar to flu or gastro and include severe headache, fever, sore throat and lethargy – with the distinctive purple rash associated often one of the final symptoms. It’s very difficult to differentiate the symptoms of a nasty cold or flu and meningitis, so if parents are at all worried, if a temperature is not being contained with medicine or if the child seems listless and lethargic, it’s better to be safe than sorry and get them checked out immediately by a GP or at A&E.